Wool-producing sheep grow fleece and require shearing. Sheep bred solely for meat production are often hair sheep, those with little or no wool. The lack of fleece means that they don't need shearing --hair sheep naturally shed their winter coats. It also means hair sheep can thrive in hot climates inhospitable to the woolly members of their species. Hair sheep fall into two basic varieties. True hair sheep are natural breeds, descended from hairy ancestors. Improved hair sheep were bred by humans in arid regions, where wool was a liability. Some improved hair sheep were crossed with wool breeds to produce larger meat animals who grew wool coats in cold weather, but shed them as spring and summer arrived. Because many hair sheep boast large horns, they are also bred for trophy hunts. In the United States, the most common hair sheep breeds include the Barbados, Dorper, Katahdin, Royal White and St. Croix. 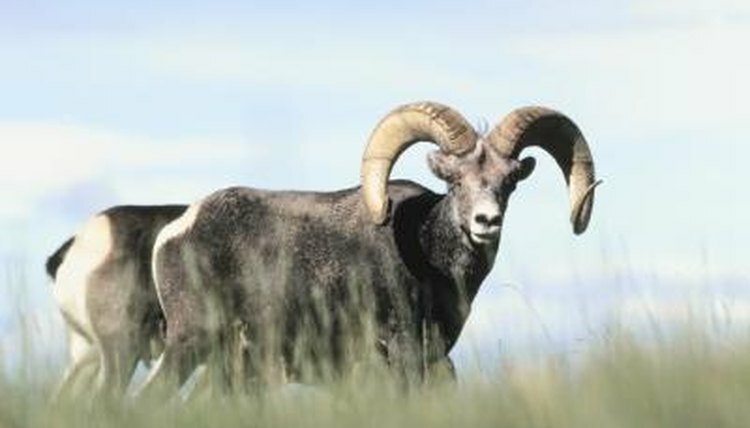 Types bred especially for trophy hunting include the Texas Dall, American Blackbelly, Corsican, Painted Desert Sheep, and Black Hawaiian. Other breeds include the Africana, White Persian, Blackhead Persian, Brazilian Somali, Mouflon, Karakul, Damara, Red Masai, Morada Nova, Pelibüey, Rabo Largo, Sahel, Santa Inês, Touabire, Uda, West African Dwarf and Wiltshire Horn. Overall, hair sheep breeds are smaller than wool sheep. They also require less feed. While goat are primarily used as a method of natural weed and brush eradication, sheep can do the same job. Wool sheep aren't used because harsh vegetation can damage their fleece, making the animal less valuable. That's not an issue for hair sheep breeds. Hair sheep appear more parasite-resistant than wool sheep, for both internal and external pests. They don't require tail docking, as wool sheep do to reduce flystrike and maggots. Renowned for their reproductive and mothering abilities, hair sheep usually require no assistance with lambing. While hair sheep lambs do not grow as fast as wool lambs, they have a far lower mortality rate. Hair sheep breeds have lambing rates as high as 150 to 200 percent, as many ewes deliver twins, triplets and quadruplets. While hair sheep do well in hot regions, cold weather is another story. Keeping hair sheep healthy in areas with cold winters requires high amounts of feed and warm shelters.